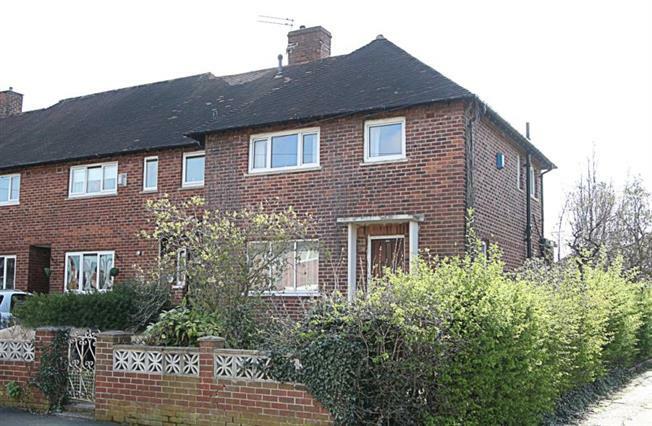 3 Bedroom Semi Detached House For Sale in Sheffield for Guide Price £80,000. A three bedroom end terraced family home in a popular family area now needing some TLC and refurbishment but with potential. In addition the house is situated on a good sized corner plot so there is potential to extend (subject to all necessary consents and approvals). The house had gas central heating, UPVC double glazing, car port providing off road parking and gardens to front and rear. This property will appeal to local builders or residential buyers looking for a property project. Viewing advised to appreciate the opportunity offered. Location - Richmond is a suburb of Sheffield lying in the eastern part of the city. The area is popular with families and benefits from excellent road and bus links to and from the City Centre and links to the motorway network. The area is in easy reach of Meadowhall Shopping Centre. Woodhouse and Handsworth offer excellent shopping including an Asda Superstore, independent shops, bars, restaurants and sports facilities. Crystal Peaks Shopping Centre and Drake House Retail Park are also within reach. Ground Floor - Hallway with stairs to the first floor, dining room to the front, lounge with door opening onto the garden, galley style kitchen leading to rear porch with store and W.C.
First Floor - Landing with access to loft space, two double bedrooms and third single bedroom. Modern style shower room/W.C. Outside - Front garden, extending to the side of the property and leading to good sized rear garden with variety of planting and a shed. To the rear of the house is a car port providing off road parking accessed off the road to the side of no.80. (note: kerb requires some adjustment).